The Maine high school football season just won’t feel the same this fall, or even this summer. Not with one of its iconic structures sitting vacant, almost like a memorial to former days of football glory. It was announced last week that Waterhouse Field in Biddeford has officially been closed, due to an independent study finding the bleachers too dangerous to sit in. 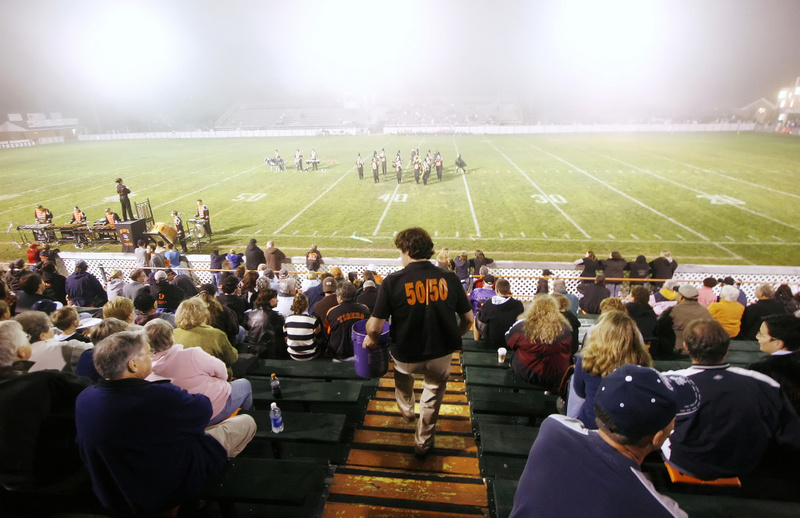 The field has been the longtime home of several Biddeford High School sports. However, it’s always been most associated as the home of Biddeford football, including its dynasty during the 1980s and early 90s under the leadership of Maine Sports Hall of Famer Mike Landry, who led the Tigers to six state championships. It’s also the annual host of the Maine Shrine Lobster Bowl Classic — which is essentially the Maine high school football all-star game — with proceeds from the game going to Shrine Hospitals across the United States, Canada and Mexico to help children with orthopedic or burn injuries. But not this year. And who knows when Waterhouse will host a game again. According to a story last week from Mike Lowe of the Portland Press Herald, costs of renovations at Waterhouse are estimated to be between $3.4 million and $5.5 million. It’s already been decided that the Lobster Bowl will move to another location this summer. No definitive decision has been made for the fall season just yet, but under the current cost estimates and renovations needed to make the stadium safe, it seems highly unlikely the Tigers will be hitting the field at Waterhouse anytime soon. This is news that hits hard on several levels. It hits hard first and foremost for the players, raised by fathers or uncles who likely were members of the Biddeford heyday under Landry. Raised on the stories of how Landry — who had a record of 135-37 over his 17 years at Biddeford — could get the most out of each and every one of his players. The next dynasty can always begin this season for the Tigers, but without Waterhouse Field to play on, it would be an odd beginning to that dynasty. It hits hard for Biddeford parents and alumni, who showed up early enough on Friday nights or early Saturday afternoons to park their vehicles in the grassy area just beyond the press box bleachers, and create a near traffic jam on West Street just to do so, simply for the possibility of having the best parking spot in the house. Or those who greeted people at the ticket booth on the Prospect Street side, the 50-50 raffle game that greets you immediately after buying your ticket. Or the crew at the concession stand — who in this writer’s opinion put together some of the best game day food in York County. For me, the closing of Waterhouse Field — and it’s uncertain future — is almost like closing a piece of my childhood. I lived in the Biddeford/Saco area for over two years when my parents divorced in 1991. The very first game I ever attended was a Biddeford football game, against ancient rival Thornton Academy in the annual “Battle of the Bridge” game during the fall of 1991, a game Thornton won 27-21. The Tigers got the last laugh, moving on that season to beat Gardiner 36-15 for the Class A state title. At six years of age, I thought the game, the rivalry and the players, were all larger than life. I moved to Waterboro by 1993 but finally got the chance to play at Waterhouse as a member of the Massabesic junior high football team. While we certainly didn’t pull the crowd the high school team did, the experience was still surreal. The stadium looked old even then, but to me, it was like playing at Lambeau Field. You knew you were playing ball in a historic place. One of the worst games of my high school career came at Waterhouse. During my senior season, I was a member of the kick return team for Massabesic, on the second level of blockers. Biddeford’s kicker decided I was the Bill Buckner of that particular squad, and to my horror, I proved him right. I botched two attempts at a return, which thankfully didn’t affect the game, but was one time I couldn’t have been happier to leave a game at Waterhouse. The final game of my high school career was at Waterhouse. I remember everything. Warming up to the usual sound of “Eye of the Tiger” by the band Survivor blaring over the loud speakers. Standing on the sidelines so close to the fence and stands that you almost felt like you didn’t really have room to move around. I remember the scoreboard clock hitting zero. Crying with my teammates in the end zone, thinking I would never be able to play football ever again. It was a sad day, but for some reason I was happy that, if my career couldn’t end at Massabesic’s Ronco Field, or in a state title game, that it ended at Waterhouse. My first sports writing gig was at the Journal Tribune in Biddeford, and for three years I covered games at Waterhouse. Chatting with Biddeford football players who, like others in previous generations, just wanted to continue the Biddeford legacy. To take the field at Waterhouse every Friday night. To play their hearts out. To win. One Biddeford tradition effectively died in 2015, when the Tigers moved from Class A to Class B. It ended the Battle of the Bridge with Thornton, a game that was a constant between the two cities for well over 100 years, dating back to 1893. And, for the moment, another Biddeford football tradition is gone. There was never any question the field needed repairs. The visiting bleachers are 31 years old, the home bleachers are 18 years old. Lights need to be replaced. At times through the years, the scoreboard has given out during the middle of games. But it was still Waterhouse Field. It was still a piece of state football history, warts and all. It almost seems the Tigers will begin the season with an 0-1 record. Wherever Biddeford plays this season, it won’t have the same feeling. It’s a loss for the school, a loss for the city and a loss for Maine high school football.